DaisyTweets, Kizmet311, Farawayhills and 1 others like this. So, is that two shows lined up in the UK for right before album launch? Smokyiiis, Hil, rainbow1 and 1 others like this. Sure looks like it to me Kizmet! rainbow1, Kizmet311 and DaisyTweets like this. I don't think I've been so pleased and excited about any of Carrie's dates as I am about this one! The show will be part of a camping festival in Leicestershire (in the English East Midlands). Our own artists, such as Ward Thomas, the Shires, and the lovely Una Healy, often draw on similar influences to those Carrie shows in many of her hits. Anyone who's at all familiar with my posts over the years probably won't be surprised that I'm also excited to see her billed with the likes of Lee Ann Womack, Angaleena Presley, Brent Cobb, Caroline Spence, her fellow Okie Parker Millsap (and on other days Elizabeth Cook, Charlie Worsham). I've supported the broad range of Country Music all along - sometimes against fans on both sides of the debate - and I'm convinced that events like this (and our relatively new Country TV station, which is stylistically broad ranging) are closer to what most Country fans here want. Artists like Carrie can benefit from this audience if they are to increase their core base here - and she deserves it - having supported the Country audience here probably for longer, and with more consistent loyalty in her image and statements, than most of the current artists of her generation, who are getting major Mainstream airplay in the States. Hil, Suellen, rainbow1 and 4 others like this. rainbow1, liz278 and txacar like this. Baylen has lived and worked in the UK for many years, and has hosted shows on the BBC and regional radio stations quit often, and has run other festivals. He's also an executive officer of the UK Americana Music Association. He and Carrie's booking agents, Creative Artists, would have fixed this date between them - but I'm sure Carrie and HQ management would have signaled clearly what they wanted. Bob Harris, who is also taking part in the Festival may also have helped, as he's been a long time supporter of Carrie. Creative Artists reps here have long argued that Carrie can get major exposure without compromising her Country identity - and I think that is always what she's wanted. Headlining an all embracing Country festival like this, outside the capital, plays an important part in reinforcing her core image here - though I'm sure she will also take other opportunities to connect with audiences outside the Country base. Last edited by Farawayhills; 06-25-2018 at 05:28 PM. liz278, hjj, rainbow1 and 3 others like this. Will you get to see Carrie at all, when she is there?!! I hope so!! Kizmet311, DaisyTweets, hjj and 2 others like this. Thanks! But responsibilities really rule it out (I'm sole carer for a very frail 97 year old aunt - and I have to stay within immediate reach of the house). Thank heavens for the internet, though! txacar, Kizmet311 and rainbow1 like this. rainbow1, Kizmet311 and Farawayhills like this. DaisyTweets, maddkat, hjj and 5 others like this. Happy for her international exposure and her fans who get to see her live. How exciting ! Farawayhills, rainbow1 and oldyfan like this. Kizmet311, rainbow1 and oldyfan like this. 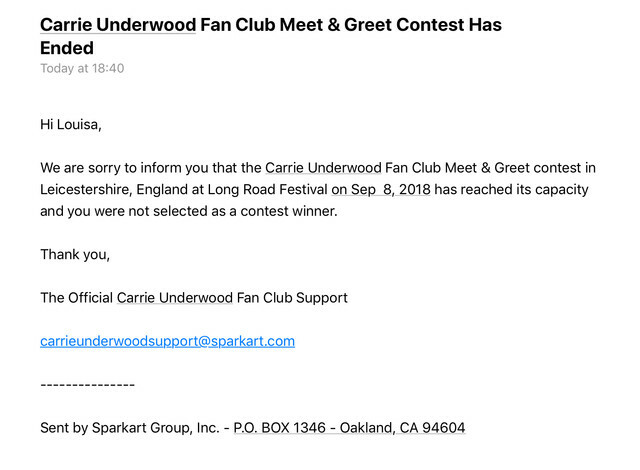 Awww... I’m still excited to see Carrie’s performance and to hear “Cry Pretty” live. rainbow1, hjj, oldyfan and 1 others like this. Awww, I'm sorry you didn't win! Fans at Tuckerville heard Love Wins Today so you guys going to this will too like when she does Concerts here in the states will too. Thanks for the information! Were you at that festival yourself? I saw video of her on Twitter singing LW today. What an amazing new song from @carrieunderwood Not long now until we get to see her perform at #TLR18! ♥Lil_Underwood♥, txacar, Renegade Runaway and 1 others like this. By John99 in forum Got Talent!